Alright, we are biased. We are a professional appliance repair company that services all major brands and domestic appliances. 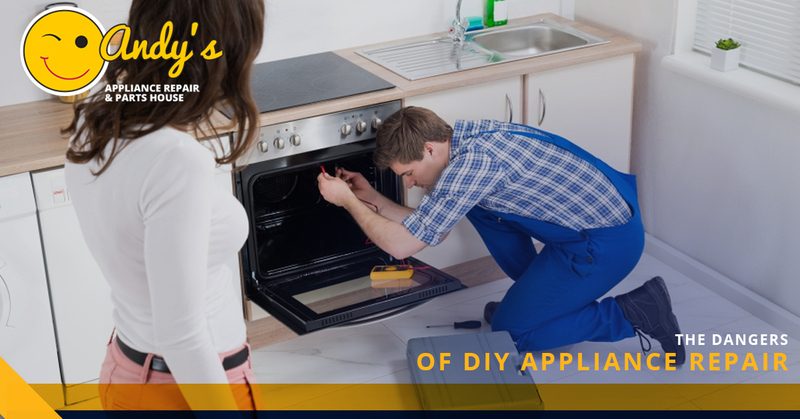 So when we write about the dangers of Do-It-Yourself appliance repair, we fully admit that our livelihood is connected with the fact that most people need to call expert appliance service to get their broken GE dryer or Whirlpool refrigerator fixed. It should also be noted that we have written a handful of blogs in the past that have (hopefully) helped our readers identify issues that are perhaps easy to fix. At the bare minimum, we’ve intended to guide homeowners with some initial steps in diagnosing issues. It might be that your garbage disposal’s switch has been inadvertently flicked off by a nudged garbage can underneath the sink. Similarly, your worries that you might need to replace your brand new Samsung dryer and washing machine set might be solved with a simple check of the power cord. It might not be plugged in. Or it might be the case that it’s a circuit breaker issue. In that case, all you have to do is located your electrical panel, open it up, and look for a breaker that has moved from the “on” to the “off” position. It might sound overly simplistic, but at the same time, it happens more than you’d think. And taking the time to check on those easy fixes is certainly worth it when you consider the alternative is calling your local appliance repair company in Omaha or Lincoln for a service appointment. Still, there’s a balance that should be struck between the two. We are not an appliance service company that has been in existence for nearly half of a century by not having our customers’ best interests in mind. If we can help clients save a buck or two, that’s great. If the appliance repair issue at hand is more complicated than that, then that is where we do what we do best. The issue for the average homeowner then becomes distinguishing between DIY-able appliance repair projects and issues that require a professional technician. Spoiler alert – unless you have significant experience working with the major appliance brand and model in question, we advise to leave it to us. Keep reading to find out why. It’s a great feeling when you don’t have to dip into your checking account to get your refrigerator or other kitchen appliance fixed. It’s even better when you are able to identify the problem yourself and take care of it on your own. But there are plenty of horror stories out there that would advise against being too liberal with this idea. The primary instance where this holds true is trying to DIY electrical work. Unless you are an experienced appliance repair technician (like the ones we’ve got here at Andy’s) or a certified electrician, please don’t do that. Even if you have a skillset refined enough to rewire something, you should know that it’s not necessarily wise. Your insurance company wouldn’t cover anything that went wrong, in all likelihood. So even if you don’t electrocute or cause a fire, you might cause serious damage down the road. Whether your range and oven is gas or electric, it’s not a fantastic idea to get in there and poke around until you think you’ve fixed it. Take it from us at Andy’s Appliance Repair; your oven and stovetop are complicated, nuanced appliances which aren’t designed for the average joe to be able to fix via a process of elimination method. Again, we aren’t intending to scare you into giving Omaha’s top appliance service provider a call. We are simply sharing the facts, folks! Whether you are looking into washer and dryer repair, compactor repair, or another appliance that needs service which we haven’t covered, it’s a good idea to let the experts handle it. If you needed convincing, we hope that this article has help guide you in the right direction. If, on the other hand, it has aroused in you the need to prove us wrong, goodness knows we tried. Here are a few examples of appliance repair service we perform in Omaha, Lincoln, and beyond. There are a lot to name, so we won’t bore you with a comprehensive list. It’s safe to say that if you have an issue, give us a call and we will almost certainly be able to provide you with an affordable solution in Omaha and beyond. With appliance repair centers in Omaha and in Lincoln, we have the biggest appliance parts inventory in the area. The net effect of that fact is that you are able to get your “appliance repair near me” or “appliance parts Omaha” needs met much sooner than other appliance repair service providers. Our combination of value and quality is unmatched in Nebraska. Our people make the difference. The fact that our staff is knowledgeable, experienced, and friendly means that you can trust Andy’s for reliable domestic appliance repairs. Give Andy’s Appliance Repair & Parts House a call today, or schedule your appointment online!